Rain appears in the Garden State's forecast for each of the next 5 days while flip-flopping daily temperatures depend entirely on the wind direction. The past two days' weather was deceiving and confusing. The perfect sunshine was delightful. The cold and wind? Not so much. 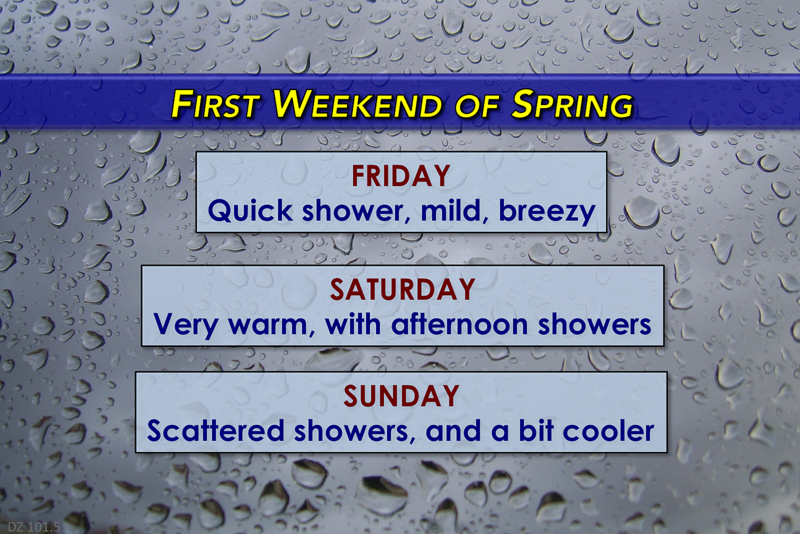 Our weather forecast takes a definitive, noticeable turn toward Spring through this weekend. That not only means it's going to get warmer, it also means it's going to become a bit unsettled and generally wetter too. Friday morning is starting off cold, with temperatures in the 20s and lower 30s. The clear skies won't last long, as we'll progress toward partly to mostly cloudy conditions as the day presses on. The wind will blow from the southwest throughout Friday. On the one hand, that wind will be brisk at times, gusting to 20 or 30 mph. On the other hand, a southwest wind is almost always a warming wind. Temperatures will return to the near-normal lower 50s by Friday afternoon. On the precipitation side, a complex of rain is diving out of the Great Lakes. As a result, we'll see a quick round of showers around midday Friday. In Thursday's forecast, I presented a concern about some freezing rain. If our impending showers arrived early enough, while temperatures were still around the freezing mark, we could have developed a pretty serious ice problem. However, the vast majority of the raindrops now holding off until after 10 a.m., my level of concern has dwindled too. While I wouldn't rule out icy spots early Friday, it should not be a widespread, dangerous situation. Friday night should stay dry, with partly cloudy skies and not-too-cool temperatures in the mid 40s. I've been promoting Saturday as the warmest day of the week, and that description still holds true. However, I don't think we're going to escape with a perfectly dry day. Highs temperatures on Saturday will range from near 60 degrees in North Jersey to near 70 degrees in South Jersey. Skies will be mostly cloudy to overcast, with a light breeze. Scattered showers may push into New Jersey (especially North Jersey) starting Saturday afternoon. And there are more showers ahead for Sunday too. Once again, they'll be scattered — on-and-off, hit-or-miss. Not a washout. While I could try to pinpoint the timing and location of the rain given the latest model information, that would be a low confidence assessment. Just be prepared for occasional raindrops on Sunday. Meanwhile, Sunday's wind switches to an easterly direction. Ocean water temperatures currently stand at about 40 to 42 degrees along the Jersey Shore. As the wind blows over that chilly water, we'll likely see thick cloud cover and overall cooler temperatures (especially for the eastern half of New Jersey). By the way, this "on-shore flow" scenario is typical for the warm seasons in New Jersey, usually a contributing factor behind our coolest summer days. Sunday afternoon's high temperature will be quite a bit cooler than Saturday's. High temperatures will range from the mid 40s for northern and coastal New Jersey, to the mid 50s for inland South Jersey. A series of storm systems will keep our weather unsettled (read: wet) for Monday too. In fact, it appears Monday will be the wettest day of this stretch, with periods of steady rain possible. But again, not a washout. Winds will flip again, again coming from the southwest, potentially pushing high temperatures back into the mid 60s by Monday afternoon. One more day of scattered showers is forecast for Tuesday, with seasonable highs in the mid 50s to around 60 degrees. Models currently show all rain activity in New Jersey will cease by early Wednesday morning. Between Friday and Wednesday morning, rain gauges across New Jersey will likely have picked up anywhere from a half-inch to an inch-and-a-half. I suspect the highest totals will fall over North Jersey. Enjoy the warmup, and don't forget that umbrella! Have a great weekend!